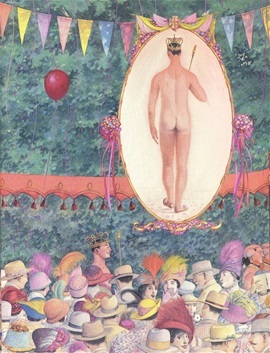 Angela Barrett's illustration from "The Emperor's New Clothes" by Hans Christian Andersen (Cambridge, Mass. : Candlewick Press, 1997). This article tries to defend Senator Mike Duffy. As for the author, I was born in Hungary, in 1949. My father lost his life in the 1956 revolution when a Russian missile exploded near him. In 1976 I fled to Canada when it was still a free and democratic country, maybe the most livable country on Earth. Returning to Mr. Duffy, his issue is minor, only a tip of the iceberg. A tip may be covered up easily by a mat but an iceberg cannot be swept under it. What I mean is the present fragile state of Canada, structurally. A huge fault line is dividing the country: Parliament and Canada’s impartial judges on one side while some Cabinet ministers and the federal public servants on the other. It seems that the Cabinet granted to our bureaucrats endless powers taken from Parliament and the judges with integrity. The latter two suffered a “short circuit” and gradually become redundant. Our federal judges are excellent but the nation’s problems simply cannot get before them. The ministers pressure the court registries not to file pleadings that would expose their torts and illegal mess. A high percentage of Canadians feel that most of our judges are corrupt and crazy that protect the criminals but ignore the safety of the public and the police. Such view is wrong. The real reason lays at a tortious website, “Representing Yourself in the Supreme Court of Canada.” In it, the Registrar (Mr. Bilodeau) simply silences s. 61 of the Supreme Court Act that would allow appeals if errors in law are claimed at the lower courts. Instead, he is raising s. 40. (1) to exclusive power. The result is devastating for Canada’s court system. A single administrator is usurping the power of the nine SCC judges. Say, you own a big company that suffered losses in millions of dollars due to federal torts or misrepresentations. The administrators of the SCC Registry will stop your appeal as of right, since you are not a criminal. The Chief Justice needs to find only another judge who sides with the Crown. Then your firm would not get a hearing by the panel of nine impartial judges. If you file an application for reconsideration, the final verdict would come – as it happened in my case – from the Registrar saying, “I do not think that your appeal would succeed.” The Registrar is not a judge. Maybe this whole streamlining started on His Majesty’s birthday in 2006. King Stephen maybe did not want a cake, only favours from four of his ministers to cut some corners. The four cornerstones had sharp corners, indeed. In seven years, the administrators managed to grind them into ball shape. But how could one build a fortress on such globular keystones? One of the cornerstones was immigration. In 2006, the Crown introduced two unlawful policies named IP 2 (Processing Applications to Sponsor Members of the Family Class) and Memorandum of Understanding (MOU). Their purpose was, of course, streamlining. No one in the Cabinet cared that it resulted in violations of over 40 paragraphs of the legislation. These policies decided that, in case of social benefits paid to new immigrants, the fault was always at the sponsor. Thus, the immigrants and the federal or provincial administrators were always innocent. The mislead sponsors are assured that in case of default they could be heard by a Court – that does not happen in reality. The IP 2 claims that “A Sponsorship Agreement is a contract” or a “written contract” and the Undertaking “is a binding contract” but the sponsors are unaware of the trick. They have no idea if they’ve signed any contracts. It’s not in the title. Also, no one has signed those on a minister’s behalf. 132. (4) of the Regulations of the IRPA clearly states that the sponsors signed statements and declarations, instead of contracts. By misrepresentation, the ministers call them contracts because then, they pretend, the CRA can garnishee the alleged debts without a ministerial certification prescribed by s. 146 of the IRPA. Thus, the Federal Court does not maintain a file with the certified debts of the sponsors. The governing case is Canada (Attorney General) v. Mavi (2011). The order states many times that the Crown is obliged to certify the debts before any garnishment. [The certification should happen through the Federal Court, so a hearing may be necessary.] Our ministers openly ignore such ruling and the laws of Canada. In a nutshell, this is the Cabinet’s money extortion scheme that destroys thousands of innocent families, often without gaining much. The alleged total debt of the family class sponsors is just a fraction of the security costs of our G-8 Summit 2010. This is an open rebellion and conspiracy of Canada’s ministers and administrators against Parliament’s will. Perhaps Mr. Nicholson should propose a new retroactive paragraph, hidden in another omnibus bill, stating that the laws of Canada are only guidelines that are not applicable for ministers and public servants. In my case, I sponsored a woman who – six months after her landing – wanted to become independent. We divorced in 2002. She found a wealthier man but, at the same time, BC paid her welfare for five years by mistake. I remarried in China in 2006. After a silence of eight years, beyond the 6-year limitation period, the CRA began to garnishee me. So far the Crown refused to grant any visa for my wife and her student son. Alberta’s workforce would need both of them but Canada’s tort prevails. Thus, I keep sending almost half of my income to China. My monies do not support our local economy but a country that is Canada’s main competitor. Now, consider the huge loss for our country when thousands of sponsors are similarly separated from their families by force. This is called cruel or unusual treatment or punishment in the Canadian Charter of Rights and Freedoms. Finally, Service Canada informed me that they may garnishee part (or all) of my future pensions without any court proceeding, due to my alleged debts. If I move abroad, my OAS benefits would be lost, too. My most logical solution would be to revoke my Canadian citizenship as an official protest against our totalitarian regime. I’d have better chances to get a grant from Beijing for writing an anti-Harper book about Canada’s collapsing democracy than to file pleadings at a federal court registry. I.e., the federal Registry in Edmonton made seven errors in law at seven steps in 2012-3. If the administrators can lead our short-circuited Canada forever, we need only King Stephen, without paid members of Parliament. If no judges can hear us, we do not need paid judges either; the ministers could pick up their paycheques. In such hocus-pocus, we should look at the south. In Brazil, Venezuela and Ecuador, the extreme right regimes have lost their credibility and supremacy for good. And, yes, this shift to the centre-left has happened in the US as well. Canada could have such coalition government if our conservatives have no solutions how to behave and survive lawfully. Now Canadians start to understand that the executive power in the country is controlled by a trio (the A.G., Chief Justice, and Registrar of the Supreme Court) supporting the Cabinet. The honourable white-collar tortfeasors effectively control the Supreme Court, also the registries of the lower courts that easily block the filing of a statement of claim against the regime. The leaders of any country may successfully copy King Harper’s perfectly evil recipe how to turn any democracy into dictatorship. Perhaps His Majesty is perfect, innocent, and has no idea about these problems, as a victim of his own wizard ministers. The Emperor’s new clothes, written by Hans Christian Andersen, may come to the readers’ mind. The picture dwarfs the issue of Mr. Duffy. It is worthwhile to compare the modern social logic of our Canadian leaders with that of the “primitive” Aztecs. The latter were unable to understand the exact reasons of eclipses, while the West (and China) was much superior in astronomy. The Mexicans originally sacrificed captives mainly during solar eclipses, in order to give a good refreshing drink to the darkening Sun, using human blood. They believed that they were saving mankind by doing that. In contrast, Canadians sacrifice the lives of a few vulnerable sectors of their country. One of them is the innocent sponsors as victims of the government’s fraud. Canada and its government know that something illegal and immoral is happening but no one stands up for democracy and the protection of the defenceless groups of society.